Have you ever tried the Cha Tou Mao Cha (Crude Cha Tou 茶头毛茶)? We managed to obtain the mao-cha of Da Cha Tou（大茶头）. Since the Da Cha Tou Mao Cha gives very nice and distinctive drinking experience, we decided to release it on pre-booking basis. In Chinese, Cha Tou means “head of tea”, the small tea blocks. 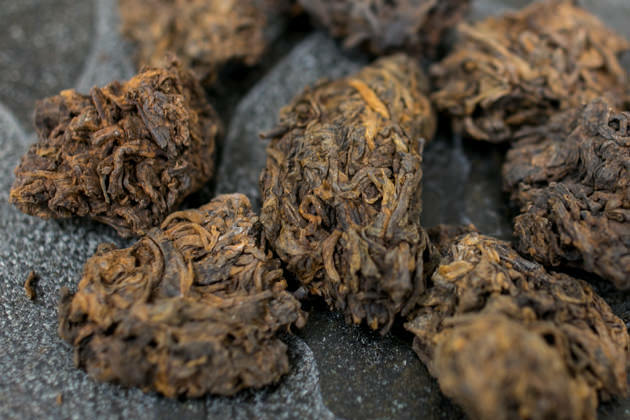 It is naturally formed during the fermentation process of ripe pu-erh tea. Because of its outstanding flavour and taste, Cha Tou is always sought after among the tea connoisseurs in China, yet most of the time the tea manufacturers will keep it for their own drinking. Those who has ever tried this tea will make an advance booking for the next batch of Cha Tou in up-coming years. 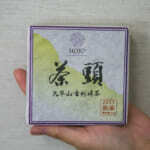 Therefore, it is very hard to obtain this tea, and it’s not a common tea in commercial tea market. This year, during our trip to Yunnan in April, we managed to purchase the very rare Cha Tou called Da Cha Tou (in Chinese, Da means Big). Da Cha Tou is not only rare but also known for its outstanding quality in both taste and flavour. As the Da Cha Tou was naturally formed during the fermentation, it has irregular size and shape. When we first tried this tea, we were fascinated by its unique drinking sensation. Since the stock of Da Cha Tou is limited, the original shape of Da Cha Tou is very beautiful and it is nice to drink, we decided to release this tea on pre-booking basis. Usually, Cha Tou varies in different sizes: big, medium and small. 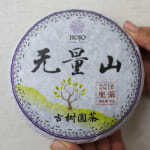 We have also bought medium Cha Tou, and that has been already compressed into 250g brick. 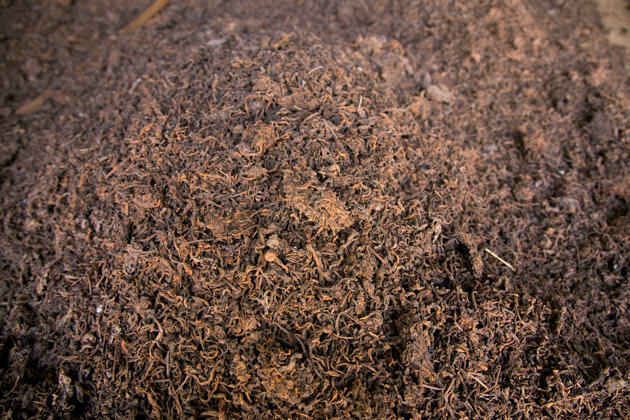 The fermentation of ripe pu-erh tea is carried out by aerobic bacteria, anaerobic bacteria and mold. Cha Tou is slowly formed in the middle of fermentation process from the interaction between tea constituents and the poly saccharide produced by bacteria. As spring tea is very rich in poly phenol and other tea constituents, Cha Tou naturally appears during the fermentation of spring tea. Normally, it is not formed in summer tea. It is because of in summer, tea grows faster due to more rain and higher temperature which result in lower concentration of certain tea constituents. Sometimes a very small quantity of Cha Tou may be formed in autumn tea. 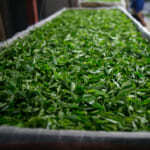 For example, may be only about 20-30kg of Cha Tou is formed out of multi-tonnes of fermented autumn ripe pu-erh tea. 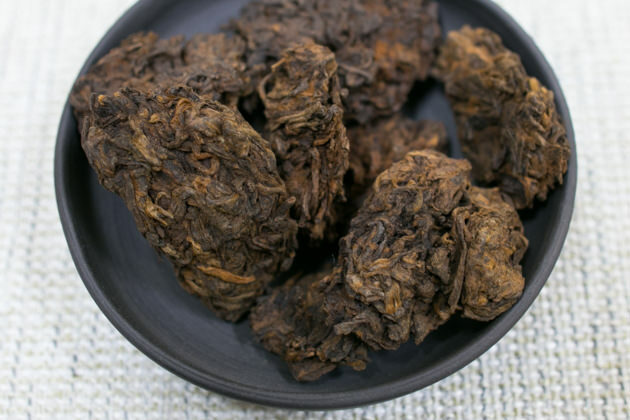 However, the Cha Tou formed from autumn tea is very loose and fragile, while the spring Cha Tou is very solid and big in size thanks to rich content of tea constituents. 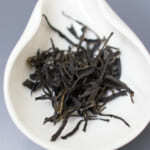 As compare to spring Cha Tou, the autumn Cha Tou gives much thinner and lighter taste, and lack of complexity in taste. Unfortunately, there are very limited ripe pu-erh tea produced from spring tea. Naturally, Cha Tou is even more limited. In addition, there are a number of tea merchants who are looking for Cha Tou. Due to the limited stock, we often face the fierce competition among the tea merchants to obtain this tea. It often happened that the Cha Tou we pre-booked was intercepted by other people. 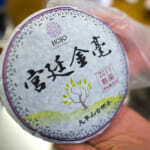 There are another type of so-called Cha Tou in commercial tea market. During the piling of tea for fermentation, because of uneven agitation, some of the tealeaf formed the lumps and it is also called Cha Tou since the shape is similar. However, if the tasting is conducted side by side to compare with the Cha Tou of spring tea, the complexity in taste and flavour and the extent of aftertaste is of different level. Da Cha Tou is unique not only because of its shape. 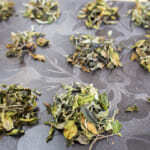 We can easily tell the difference in flavour and taste when we compare it with loose ripe pu-erh teas of the same batch. 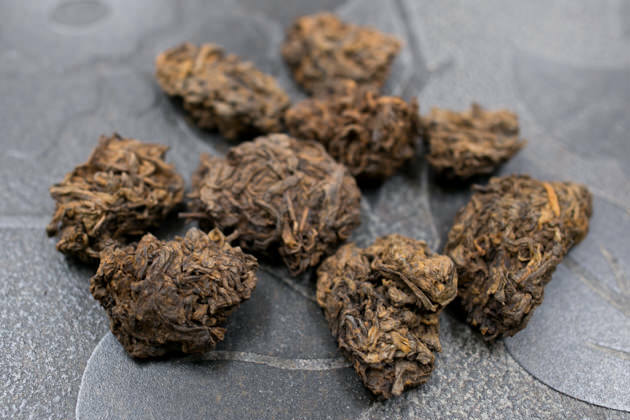 The Da Cha Tou has rich dry-fruity flavour with thick taste and long-lasting finishing. 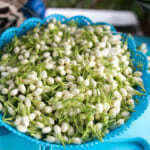 In addition, it gives very silky and creamy mouth-feel. I think the reason why Cha Tou gives very distinctive flavour and taste is because of the process of its formation. Cha tou is formed in the middle of fermentation. At this stage, the tea leaves forming Cha Tou is not fully fermented yet. As tea leaves are firmly coagulated, there is no oxygen inside it. 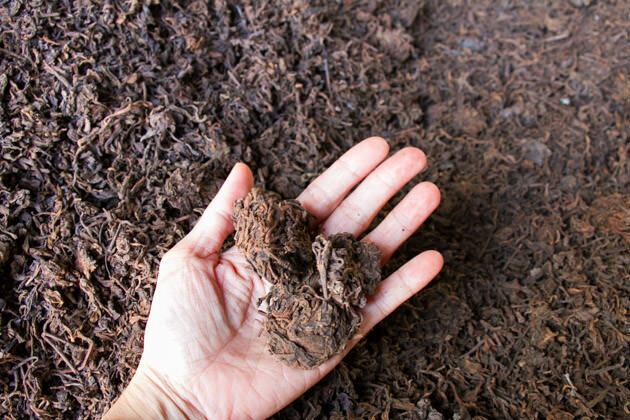 Due to the heat generated from the pile of ripe pu-erh tea on microbiological fermentation and the high moisture content, it undergoes further maturation; that could be the reason that develops unique and complex flavour. Another reason that makes this Da Cha Tou very special was it is made of raw pu-erh tea collected from the garden that follows perfectly natural farming practice. It is produced from the mountain called Huo Cao Shan. 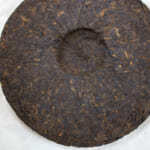 It is from the same batch of tea as the Huo Cao Shan ripe pu-erh tea 200g cake that we released earlier. As we explained in the introduction of Huo Cao Shan, the raw material of this tea is collected from the unique garden which left in wild for more than 30 years. 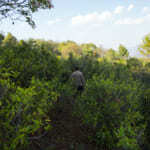 The tea garden is free from pesticide, not given any fertilizer, and the surrounding weeds are remained for many years. It gives super long-lasting aftertaste with thick flavour and mellow drinking sensation that lasts for a long time. In my own experience, this level of aftertaste is very rare in ripe pu-erh teas. One of the reasons why Cha Tou is loved by so many people is that it ages excellently well. The changes of flavour are much more significantly than common ripe pu-erh teas. It reminds me of Chinese dates, dried apricots or prunes, raisins and sometimes brandy. Usually, ordinary Cha Tou gives slight harshness in taste when tea is new. Thus, I normally prefer the Cha Tou aged for more than 2-3 years. 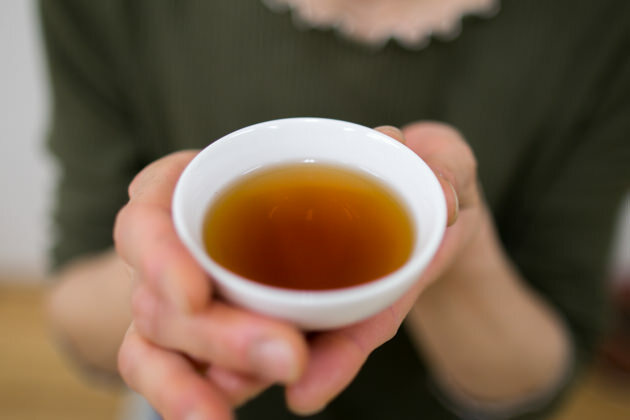 Nevertheless, I was very surprized that this Huo Cao Shan Da Cha Tou was not harsh at all and it is perfectly right for drinking now even it is just produced a year ago. In my experience, this is the first time I encountered such Cha Tou. So, you might want to drink it right away and/or keep it for further aging. Some of Cha Tou appear whitish as it contains white filaments on its surface. It is pretty normal and not harmful. Please do not worry as it is not mold. 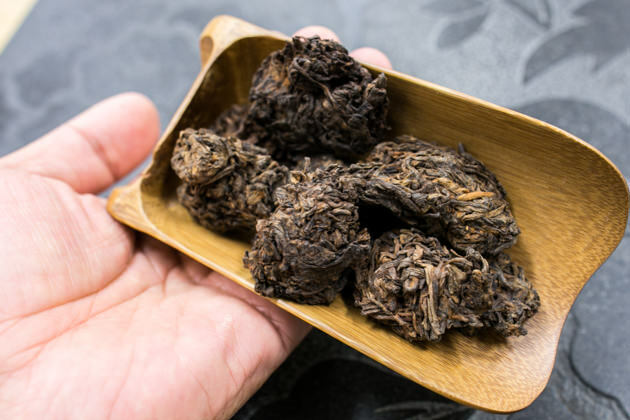 It is the friendly bacteria called actinomycetes which is the key bacteria appears when the fermentation of ripe pu-erh tea is successfully carried out. If any problem occurred during fermentation, the white filaments would not appear. Usually, these whitish filaments are not noticeable after compression. We hardly see these white filaments on the compressed tea because they disappear once tea is steamed for compression. As the quantity is limited, we decided to sell this tea on pre-booking basis. The pre-booking is opened until the end of June. However once the stock of Mao-cha is sold, we will close the booking. Please send us an e-mail or Facebook message if you are interested to book this tea. We plan to deliver the tea in July.